There are many different types of bracing, depending on the engineering requirements for a given situation. The most commonly used under a house that is not built in under is metal cross bracing. The picture below demonstrates how metal crosses bracing works, by the way in which it’s attached to the top of the column on one side and the bottom of the steel column on the other side. This 45-degree trajectory in the way the steel is fitted between the posts is what gives it the strength to prevent the house rocking. If the engineer requires it, at times turnbuckles are added to the steel rod so that they can be tightened. By doing the above as part of the first stage the owner is able to move back into the house. Then revisit building underneath at a later date. The steel cross bracing is installed just until the timber walls are fitted. 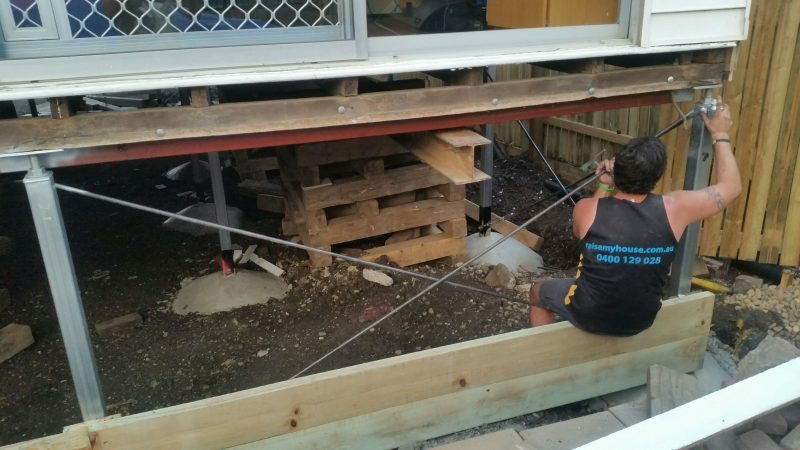 As part of the second stage of raising and building in under a Brisbane & Ipswich house raise project, the steel cross bracing is removed and replaced with timber bracing. The timber bracing is carried out by the builders responsible for building under the house in accordance with the engineering plans. The timber bracing is no longer seen because it’s fitted as part of the wall framing. There are other more technical forms of bracing that are required around bigger openings such as portal frames. If you need help or advice around installing portal frames under a house or as part of an extension then Raise My House will be able to assist with a quote.